Spike and Peach are living in Taiwan. They wanted to take photos under the plum or cherry blossoms in March or April when they contact us. At first, they decided on another place for taking photos but changed their mind before the shoot day. Because of the weather this year, the cherry blossoms bloomed later than usual. They were so lucky that the Botanical Gardens had several kinds of cherry trees in bloom during their visit. The plum trees were also in bloom. The best thing about taking photos at the Botanical Gardens is you can capture shots with many kinds of plants and flowers year-round. There is also a small Shinto shrine and water mill in the Gardens. If you don`t like an audience watching you take photos, this spot is a great choice! Dear Spike and Peach, thank you for coming and congratulations on your marriage. 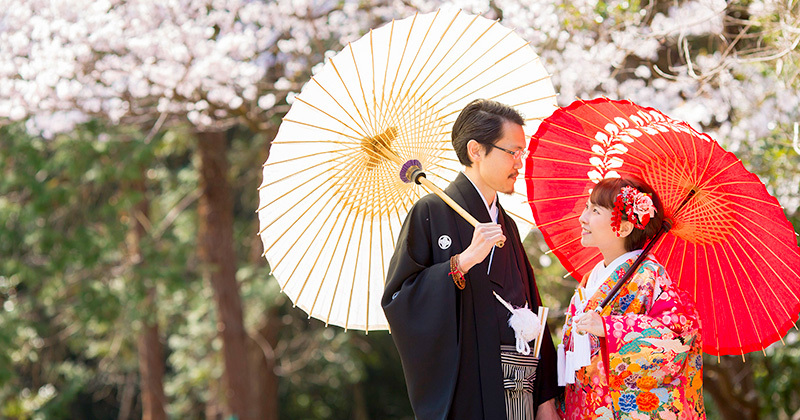 Hope you have a nice honeymoon and enjoy the rest of the cherry blossoms in Kyoto.